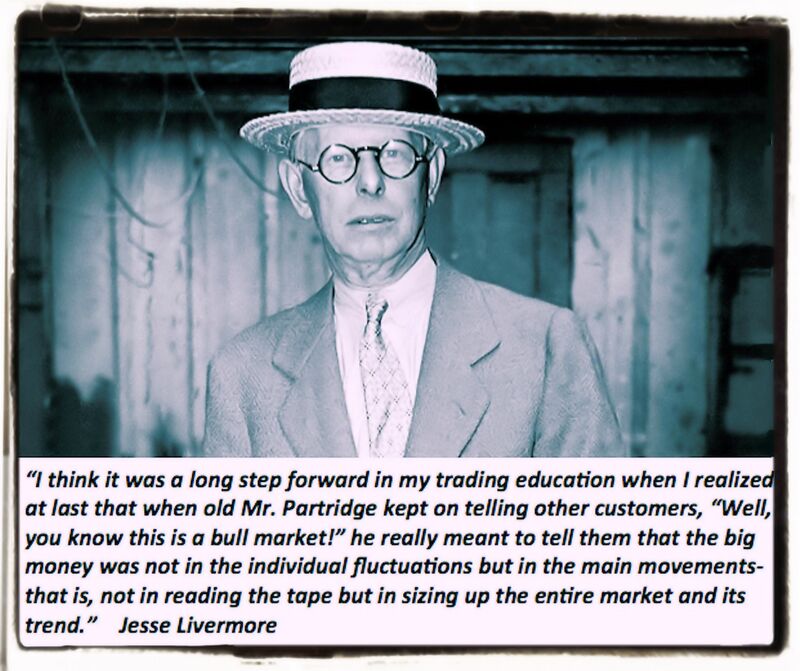 Jesse Livermore was one of the greatest traders who ever lived. Jesse Lauriston Livermore was born on July 26, 1877, and started his trading career at the age of 14 as a “chalk boy”, posting quotes for stocks at a brokerage in Boston. It was in this job that he learned to trade, and over his long career he traded both up and down markets including the panic of 1907 and the 1929 stock market crash, making (and losing) many millions of dollars. He is most famous today for being the object of the book “Reminiscences of a Stock Operator” by Edwin LeFevre. Jesse lived until the age of 63, passing away on November 28, 1940. A prudent speculator never argues with the tape. Markets are never wrong, opinions often are. If I buy stocks on Smith’s tip I must sell those same stocks on Smith’s tip. I am depending on him. Suppose Smith is away on a holiday when the selling time comes around? He really meant to tell them that the big money was not in the individual fluctuations but in the main movements that is, not in reading the tape but in sizing up the entire market and its trend. It is literally true that millions come easier to a trader after he knows how to trade, than hundreds did in the days of his ignorance. The “lucky” trader is one who minimizes mistakes and, if they do make a mistake, acts to minimize the damage by exiting from the situation quickly. In practice this means having a written plan for each trade you enter, the most important element of which is the stop-loss. “I can’t sleep” answered the nervous one. “Why not?” asked the friend. “I am carrying so much cotton that I can’t sleep thinking about. It is wearing me out. What can I do?” “Sell down to the sleeping point”, answered the friend. Speculation is far too exciting. Most people who speculate hound the brokerage offices… the ticker is always on their minds. They are so engrossed with the minor ups and downs, they miss the big movements. The semi-sucker had read books about trading – usually written by yet higher grade suckers – but he did not realize that reading books was not the same as trading experience. This type of sucker could quote all sorts of wise sayings about the operations of the stock market. He did not lose money as quickly as the beginning sucker because he had learned some of the most rudimentary trading rules. Play the market only when all factors are in your favor. No person can play the market all the time and win. There are times when you should be completely out of the market, for emotional as well as economic reasons. The desire for constant action irrespective of underlying conditions is responsible for many losses on Wall Street even among the professionals, who feel that they must take home some money every day, as though they were working for regular wages. The only thing to do when a person is wrong is to be right, by ceasing to be wrong. Cut your losses quickly, without hesitation. Don’t waste time. When a stock moves below a mental-stop, sell it immediately. Emotional control is the most essential factor in playing the market. Never lose control of your emotions when the market moves against you. Don’t get too confident over your wins or too despondent over your losses. All through time, people have basically acted and reacted the same way in the market as a result of: greed, fear, ignorance, and hope. That is why the numerical formations and patterns recur on a constant basis. There is a time to go long. There is a time to go short. There is a time to go fishing. Watch the market leaders, the stocks that have led the charge upward in a bull market. That is where the action is and where the money is to be made. As the leaders go, so goes the entire market. If you cannot make money in the leaders, you are not going to make money in the stock market. Watching the leaders keeps your universe of stocks limited, focused, and more easily controlled. One of the most helpful things that anybody can learn is to give up trying to catch the last eighth – or the first. These two are the most expensive eighths in the world. They have cost stock traders, in the aggregate, enough millions of dollars to build a concrete highway across the continent. I don’t know whether I make myself plain, but I never lose my temper over the stock market. I never argue with the tape. Getting sore at the market doesn’t get you anywhere. Failure to take advantage of a serendipitous act of good luck in the stock market is often a mistake.